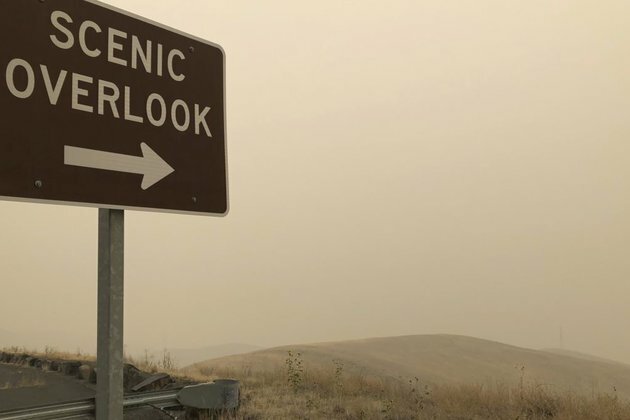 SEATTLE - Smoke from wildfires clogged the sky across the U.S. West, blotting out mountains and city skylines from Oregon to Colorado, delaying flights and forcing authorities to tell even healthy adults in the Seattle area to stay indoors. A smoky haze envelopes the skyscrapers and Rocky Mountains that usually can be seen as a backdrop to the city from a high-rise building, Aug. 20, 2018, in Denver. 'Not being able to see the mountains is kind of disappointing, kind of sad,' he said. A man twirls a young child on a waterfront park as downtown Seattle disappears in a smoky haze behind, Aug. 19, 2018. In Spokane, air quality slipped into the 'hazardous' range. Thick haze hung over Washington's second-largest city, forcing vehicles to turn on their headlights during the morning commute.